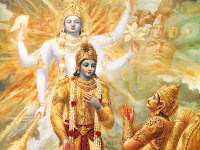 Mahabharata is one of the earliest and sophisticated repository of sacred knowledge of mankind. The long surviving text is a classic in Hindu tradition. In its famous part, there are a number of illuminating conversations that occurs between Krishna and Arjuna. From Sufi perspective these conversations are like Sohbet between spiritual master and disciple. Who really is Krishna - is enshroud in mystery. Placed in the context, Krishna is like the Divine Voice through whom God speaks. To appreciate Krishna's perspective, the sayings of Krishna could be compared to Hadith Qudsi (sacred transmission), which traditionally are God's words spoken through the Messenger. Similarly what Krishna speaks, speaks for God, as Divine Voice. This explanation is important to understand to avoid associationism (shirk). God alone is God. Arjuna is the disciple, taleb, recipient of sacred gnosis. Krishna is the giver of the sacred gnosis, like a guide of soul. Krishna is almost like Khidr. Krishna teaches the lesson of dharma (the Path, the reality of things as it is). In the final battle, Krishna teaches the warrior Arjuna that the ultimate conflict is not about land and riches and worldly power. The ultimate battle, waged on cosmic ground, is about the human spirit. In the Mahabharata, the Ultimate Weapon is summoned, a weapon that if used will destroy the world of both matter and spirit. Shrinking from one's moral duty, refusal to act even when it is most difficult to act, and egotistical attachment to one's actions - these human weaknesses pose the greatest dangers to survival of the individual and the species. The crucial struggle is the one between sacred law and selfish greed, detachment and egotism, action and illusion - and the ultimate conflict is the one between the human soul and worldly attachments. The following conversation is about "action in liberation" as mentioned in Peter Brooks' Mahabharata film (with slight modification for clarity). To act, but not to be attached with the fruit of action is a central wisdom teaching of Gita (Song Celestial), part of the epic Mahabharata. The conversation unfolds against a dramatic backdrop of an imminent battle, in which, Arjuna refuses to take up weapon and fights against apparently his own people. Krishna: "What is this mad and shameful weakness? Stand up and fight!" Arjuna: "I am in anguish. I can’t see where my duty lies. Teach me." To this request Krishna speaks to Arjuna. Krishna: "Victory and defeat are the same. To Act but not to reflect on the fruit of the Act. Seek Detachment. Fight without Desire." Arjuna: "You say, forget desire, seek detachment!! Yet you urge me to battle to massacre! Your words are ambiguous, I am confused." Krishna: "Don’t withdraw into solitude. Renunciation is not enough. You must Act. Yet Action must not dominate you. In the heart of Action you must remain free from all attachments." Arjuna: "How can I put into practice what you are demanding of me? The mind is capricious, unstable; it’s evasive, feverish, turbulent, tenacious. It’s harder to subdue than taming the wind." Krishna: "You must learn to see with the same eye, a mound of earth and a heap of gold, a cow, a sage, a dog and a man who eats the dog. There is another intelligence, beyond the mind." Arjuna: "Passion drags us away. Darkness dulls our senses. How can I find this intelligence? With what will?" 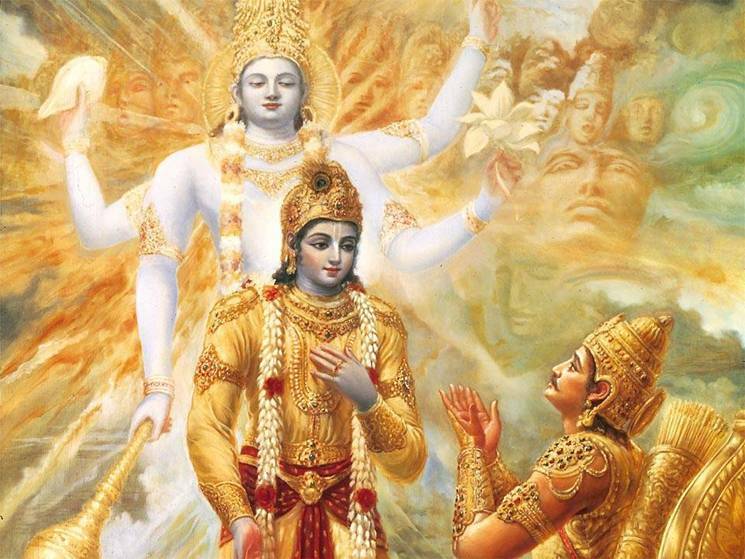 To reply to this question, Krishna lead Arjuna through the tangled forest of illusion. He began to teach him the ancient yoga of wisdom and the mysterious path of action spoke for a long time, very long time..
Arjuna further asks: "All men are born in to illusion. How can one reach the truth if one is born in illusion?" To answer this slowly Krishna lead Arjuna through all the fibers of Divine Spirit. He showed him the deepest movements of God Being and true battlefield where one need neither warriors nor arrows. Where each man must fight alone. It’s the most secret knowledge. He showed him the whole of Truth. He taught him how the created world unfolds. Arjuna replies: "I feel my illusions vanish one by one. Now if I am capable of contemplating it, show me your true Being." (And Arjuna was shown that which he was shown, Fihi ma Fihi). After being granted his wish Arjuna says: "I see you. In one point I see the entire World. ... I see Life and Death. I see silence. Tell me who you are? I am shaken to the core of my being. I am afraid." "I am All that you think. All that you say. Everything hangs on Me, like pearls on a thread. I am the Earth’s scent and the Fire’s heat. I Am appearance and disappearance. I Am the tricks that hoax. I Am the radiance of All that shines. I am Time grown ancient. All beings fall in to the night and all beings are brought back to the day light. I have already defeated all these warriors. But he who thinks he can kill and he who thinks he can be killed are both mistaken. 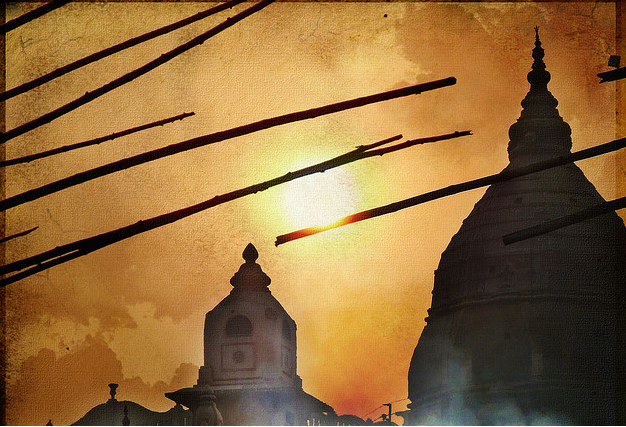 No weapon can pierce the life-breath that is pure consciousness. No Fire can burn it. No water can drench it. No Wind can make it dry. Have no fear and rise up because I Love you. Now you can dominate your mysterious and incomprehensible spirit. You can see its other side. Act as you must Act. I myself Am never without Action. Rise up." Arjuna replies: "My illusion is dissolved. My errors destroyed. By your grace now I am firm. My doubts are dispersed. I will Act according to your word." Who says words with my mouth? Who looks out with my eyes? of this prison for drunks. The wisdom of action without attachment is a timeless wisdom, validated by every authentic spiritual path. Whether we turn to Buddhism, the practice of equanimity, the practice of doing without attaching to the fruit of action - its there. Even when we turn to the Last Testament, Quran and its deep teachings, we can not help but see the same universal truth spoken again and again. A certain Sufi master used to teach his students saying, "stop seeing two, see only One, learn to see only God alone." "Wheresoever you turn, you see the Face of God" - is an exalted station only very rare and sincere lover can truly attain. Whether we poor servants, imperfect, insincere ones can ever reach that Door or not, the truth remains, wheresoever we turn, there is the Face of God. According to Islamic teachings, every Action depends on the intention (niyah) and it is the intention for which an Action will be merited, not by its fruit, paradoxical as it might sound. To illustrate the point, thats why if a person have just intended to go to pilgrimage and even though he or she can't make it or dies on the way - for having the sincere intention alone - the person is rewarded. Intention is connected with consciousness, awareness, and heart's initiation aligned to the Action - which matters the most. This universal Truth is also reflected in the words of Krishna where he says, "To Act but not to reflect on the fruit of the Act." This is because since the Real Doer is God Alone, and everything else are instruments of God, abd'Allah, servant of God - thus the fruit of Action belongs to God alone. This is one of the real reason why a true pious person can never rely on the amount of Act of devotion, prayer or pious act, since he or she never knows whether they are accepted or not by God. Thus a sincere devotee strive to purify his or her intention.When he prays, he tries to pray with the right intention to offer thanksgiving, to remember with a pure remembrance, to appreciate for all that is given. When he make pilgrimage, he tries to have the right intention - the rest is left to God. God alone is the Judge and God sees our inner heart (its sincerity in intention), not the external appearances. The implication of "To Act but not to reflect on the fruit of the Act" - is great because it enables what Sufis call Ihsan, it enables excellence. Because when we fast forward and become pre-occupied with fruit of Act, we lose our objective of the Act itself. Thus one can notice in life that when the best performers in athletics or any performance attains the most fantastic achievement, they will always tell that in that moment of doing or achieving the extra-ordinary, they forgot everything else, including the reward or fruit. A gold medal winner can never win gold medal in a 100 m race if he or she shift focus from Act to the fruit of the Act for a single moment. Its equally true in every aspect in life. Act we must, but the rest belongs to the Real Doer. Kahhon kahheen jo main kiya, Tum Hee They mujjh maai! Whatever is done, done by You; I’ve done nothing. If I say I did it, its only You Who is saying in me. 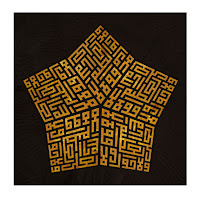 Transmitted by the Seal of Prophets, there is a sacred formula which is prized highly by the Sufi Mystics and others, which is known as Hawqala. This refers to a magnificent phrase lâ hawla wa lâ quwwata illâ bilLâh which also embodies the same truth conveyed in Krishna's teaching to Arjuna - the same universal truth realized and subsequently passed down to humanity by every enlightened figure - as in this case, was taught by the Mystic Master, Muhammad Mustafa, may peace and blessings of God be upon him. 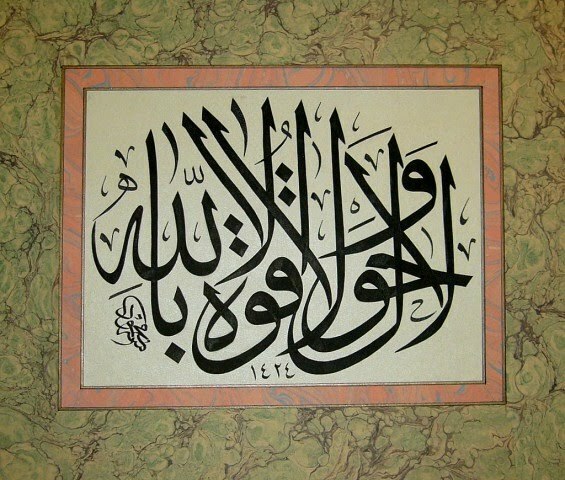 The Arabic root h-w-l depicts all manner of change and transformation. Progress is only achieved through change and transformation... and spiritual progress requires the highest degree of change and transformation. We may wish to change, but we alone do not have the power to make such changes. Such change and transformation can only occur through the tahwîl (transformation) of Allâh. That is to say, true change and transformation can arise only through the awesome and glorious powers of Allâh. 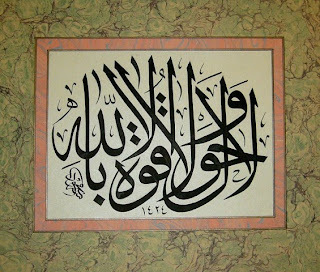 There is neither change nor power except by means of Allâh. There is no transformation or strength except through Allâh. There is neither progress nor might except through Allâh. The magnificent phrase lâ hawla wa lâ quwwata illâ bi Allâh is mentioned numerous times in the hadith (sayings of Muhammad) as being highly regarded and highly recommended by the Prophet Muhammad. Sa'ad narrated that Muhammad said, "Should I not lead you to a door from the doors of Paradise?" I said, "Do tell me, O' Messenger of Allah! He said, "La hawla wa la quwwata illa bilLah." Abu Ayub al-Ansari narrates that on the night of Ascension, Muhammad passed by Mighty Messenger Abraham. Abraham asked, "O' Angel Gabriel, who is with you?" Gabriel said, "Muhammad." Abraham said to him, "Command your Ummah (community) to plant saplings of Paradise plentifully, as the soil of Paradise is fertile and it's plain is spacious." It was asked, "What are the saplings of Paradise?" He replied, "La hawla wa la quwwata illa bilLah." The magnificent phrase is often used as meditation seed and zikr. The reason for such great esteem is mentioned because it contains great gnosis and real nature of reality, and can help the consciousness of the beginner wayfarer to reach that of the elect gnostics, by Allah's grace and transformation. There is neither transformation, nor power except by Allah. It has remedy for every illusion of our existence. May we drink abundantly from its gnosis. By Allah, so be it! the rest is merely simulation. My note of appreciation to Aisha N. for sharing the original clip of Peter Brook's Mahabharata and generously transcribing the text. May Allah bless you.